Let's dive into this high-yielding stocks' dividend. A question you might be asking yourself, then, is the following: Is Qualcomm's dividend too good to be true? Let's take a closer look under the covers to see if we can figure that out. If you're new to the Qualcomm story, you should know that the company essentially has two main business segments. The first is its chip business, known as Qualcomm CDMA Technologies (QCT), and the second is its technology licensing business, known as Qualcomm Technology Licensing (QTL). QCT primarily sells chips for smartphones, while QTL collects a royalty check any time somebody sells a 3G- or 4G-capable device, irrespective of the maker of the chip inside. That per-device payment is, broadly speaking, a function of the selling price of the device. Historically, QCT has made up the bulk of Qualcomm's revenue, but QTL has delivered most of the company's operating profits, as royalty payments tend to carry much higher gross margins than sales of components. For a while now, Apple (NASDAQ:AAPL) -- which has historically been a large customer of Qualcomm's on the chip side (although that's no longer the case) -- has refused to fork over royalty payments, something that's taking its toll on QTL's revenue and profitability. Back in November, Qualcomm CEO Steve Mollenkopf told CNBC that "the second half of this year and into next year is when we're really on the doorstep of finding a resolution [to this dispute] and we don't see anything different than that." So, what does this have to do with Qualcomm's dividend? Well, the idea is that Qualcomm's current financial performance excludes royalty payments from Apple since Apple isn't paying, but if the dispute were to be resolved in a way that's favorable to Qualcomm, the company's financial performance -- revenue, net income, and free cash flow -- would all see a significant boost. For the purposes of this analysis, let's play it cautiously and not assume the Apple-related revenue and profits will come back anytime soon. QCOM Dividend data by YCharts. 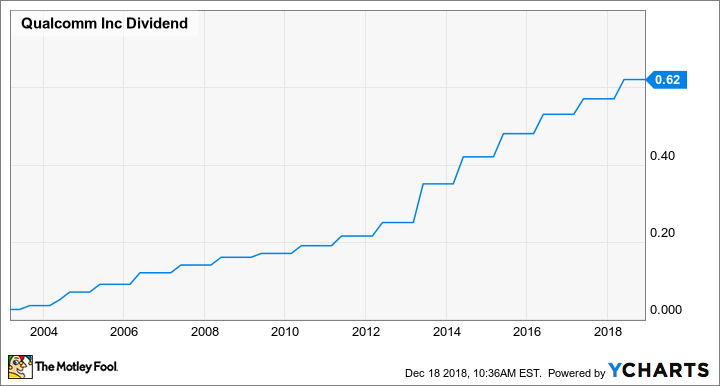 What is clear, though, is that should Qualcomm's non-GAAP EPS trend upward over the next couple of years, then with or without a resolution to the spat with Apple, the company should be able to afford to not only continue paying the current dividend, it should even be able to keep its streak of annual dividend increases alive.